Do you live in the Phoenix, AZ area and have a herniated disc, multiple herniated discs, degenerative disc disease, sciatica, facet syndrome, neck pain, back pain, numbness and tingling in the arms hands or legs? Is your doctor suggesting neck surgery, back surgery, pain management, or physical therapy? Literature has suggested traction therapy for these patients and often reports high rates of success. Research indicates the disc is responsible for a significant number of back, neck, arm and leg pain syndromes. External compressive forces increase the pressure within the disc causing the outer rings to weaken, bulge and even tear. If a disc bulge or herniation occurs, the fragments or bulging material can compress and irritate surrounding spinal nerves leading to numbness, tingling and pain. 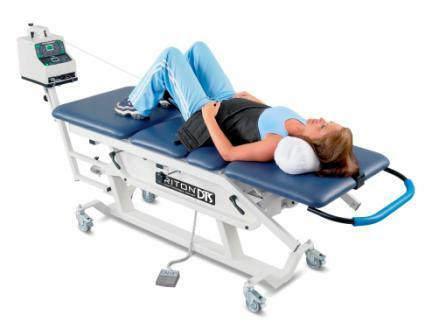 Spinal decompression therapy is a non-surgical, traction based treatment that uses a computerized guided pulley system to cycle through distraction and relaxation phases to gently separate the bones of the spine. A specific spinal segment can be isolated and placed under a negative pressure gradient, causing a vacuum effect within the disc. The disc material that has protruded or herniated outside the normal confines of the disc can be pulled back within the disc, thus taking pressure off the surrounding pain sensitive nerves. In addition to relieving nerve irritation, decompression therapy increases circulation to the disc which stimulates healing within the injured tissues. In addition to lumbar traction, our system is also capable of cervical (neck) and extremity (wrist / carpal tunnel) decompression traction. Additionally, the therapy can be delivered in a variety of different positions to maximize comfort. A typical treatment session for decompression therapy is approximately 20-30 minutes depending on each patient's condition. In most cases, the treatments are painless. In fact, some patients fall asleep during their spinal decompression sessions. We have positive results utilizing 20 treatment sessions over a 6-week period. Although treatment may last up to 6 weeks, many patients feel relief from their pain after only a few sessions. We are extremely competitive with pricing and choose to pass these savings on to you. We do not spend any money on marketing this system as many other clinics do..... which means we do not have a large advertising budget and do not need re-coup money by increasing the price for this therapy. Most likely, you will save more than half of what other clinics are charging! How do I Know if Decompression Therapy is for Right for me? At Coyote Chiropractic and Wellness Center P.C., we want to make it easy. Call our office today and schedule your complimentary consultation with one of our doctors. (480-820-0999). During this consultation you will have the opportunity to ask questions about treatment protocols, procedures and candidate selection. Together, we will help you decide if you are ready to become a patient and start enjoying the benefits of spinal decompression therapy.